Between the ramnut and ramenrrito, we're rapidly running out of absurd ramen-themed portmanteau. But celebrity chef David Chang has at least one more in the "ramlet," a special breakfast treat that incorporates instant ramen into eggs. 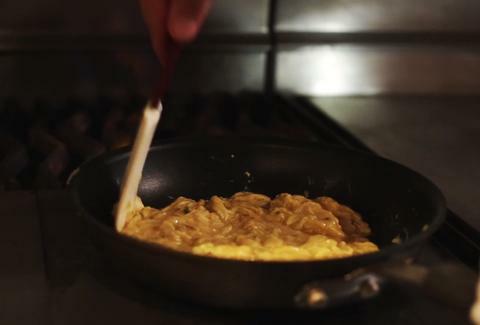 In a video for Lucky Peach's new "People Cooking Things" series, the Momofuku whiz makes a classy French omelet. Only there's a twist: he beats all the eggs with a heap of instant ramen seasoning, making for a delightfully MSG-filled dish. The process is pretty straight-forward, so you can definitely recreate this at home. Just make sure that, like Chang, you have a "stunt double" on hand for your gutsiest whisking. Kristin Hunt is a Food/Drink staff writer for Thrillist, and orders omelets whenever possible. Follow her at @kristin_hunt.